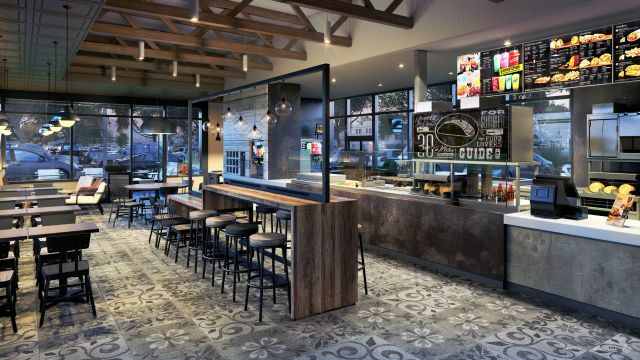 Taco Bell is trying out four new restaurant designs for new and remodeled locations. Common features among the new designs seems to be patterned flooring, exposed wood, and an open kitchen. 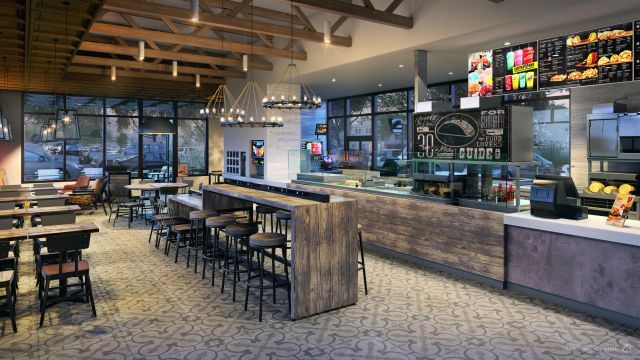 The four designs make their debut in Orange County, California this summer through existing restaurant remodels, with a broader roll-out planned in the near future. 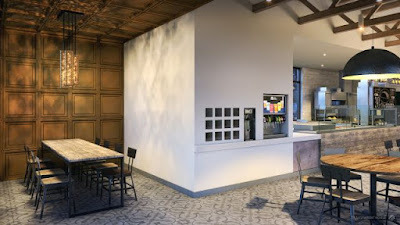 - Heritage - "Inspired by its culinary roots in Mexican-inspired food with a twist, this style is a modern interpretation of Taco Bell’s original Mission Revival-style characterized by warm white walls with classic materials in the tile and heavy timbers." 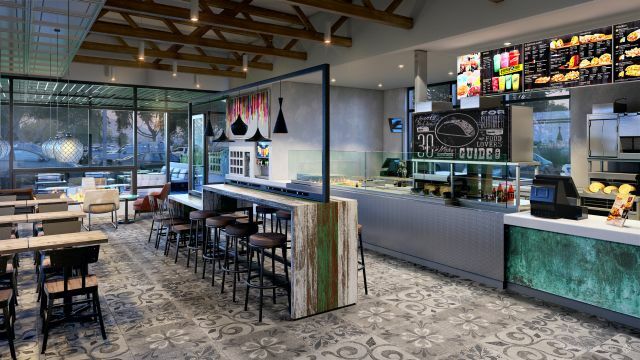 - Modern Explorer - "This rustic modern style is a refined version of the brand’s Cantina Explorer restaurants and can easily fit into a suburban or rural environment. 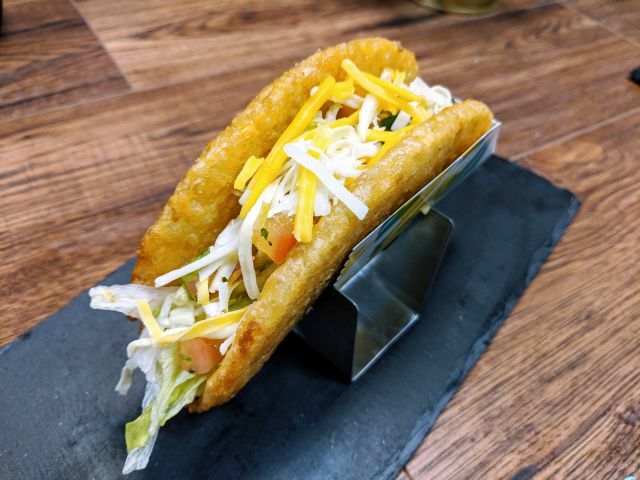 Inspired by the farms that make our food, this style reinforces Taco Bell’s commitment to the best ingredients, authenticity and transparency of materials and dining preparation." - California Sol - "Inspired by Taco Bell’s California roots and the California lifestyle, this design blurs the lines between indoor and outdoor. It’s a celebration of dining al fresco and embraces a laid-back beachy feel both inside and out." 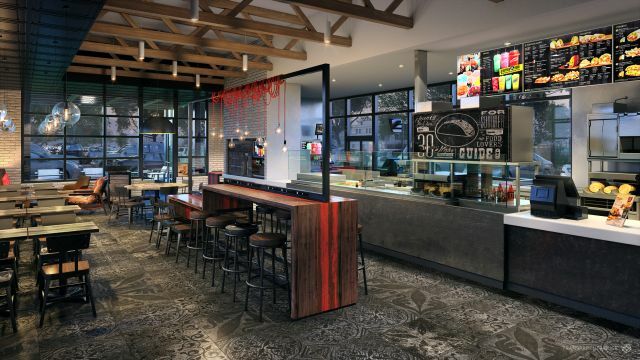 - Urban Edge - "This design represents an eclectic mix of international and street style done the Taco Bell way. This style is inspired by timeless design married with cutting-edge elements of the urban environment." Taco Bell plans to build 2,000 more restaurants by 2022.